Highly refined, non-stabilised, aromatic-free paraffinic ornaphthenic white mineral oils complying with the stringent pharmacopoeia purity requirements. Ondina oils can be used in pharmaceutical, food packaging, cosmetic and other applications, where this high purity where this high purity is required by legislation or important for the quality of the finished product. 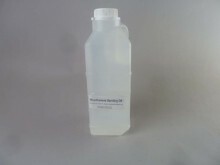 Water-White, odourless and tasteless paraffin oil food safe, non staining. A problem that most wood turners are faced with is dust when sanding. It’s the stuff you cannot see that will kill you. Using medicinal paraffin oil takes away this risk. Also you don’t end up with heat checks in the end grain due to overheating in the sanding process. Extends the life of sandpapers and mandrels as wood like gummy Kauri that bakes into the paper is turned to a slurry easily removed with a wire brush. I find it is quicker to sand as well. Totally food safe, after sanding the oil only needs to be finished with Bee Kind wax. I would recommend power sanding as normal to 180 grit then lock up the end grain with sanding sealer this prevents darkening in that area and also tracking of the oil. My process is to sand to 180 grit as normal then with a mix of 50/50 Cellulose sanding sealer or 50/50 thinner and then Wattyl Stylwood lacquer. Apply a generous amount to the wood. This locks up the end grain and prevents the darkening that can happen when sanding with oil or applying your end finish. This quickly forms slurry when sanding, easily removed from the paper with a small wire brush. Wipe out the slurry with a kitchen wipe re-spray and sand with the next grit. I find these speeds up the sanding process, works especially well on those gummy timbers that normally bake the resin into the paper giving it a short life. Also because you are sanding with oil the heat is kept to a minimum lessoning the chances of heat checks and overheating the Velcro on the mandrel. On salad bowls and craft items, I then apply Bee Kind woodturners finish and buff to a lustre. Note: This item can not be shipped overseas. Click the button below to add the Woodturners Sanding Oil / Shell Ondina Oil 15 - 1 litre to your wish list.